Wow, what deep and rich colors. a very striking picture! The colours in the mountain are lovely. It would be nice if you could get more of a natural look. Lovely textures and the mountain in the background gives the whole painting a pulse…………….I feel like I`ve been there, well done. I won’t allow myself to critique it because I have not successfully oil painted a landscape but I will say good job capturing the essence of that landscape; contrast and color. Also considering the dusk period of time. You have created nice textural shapes in this painting and have good clean use of color. When I squint down at your painting through my eyes I notice that the two grassy sides along the water are very similar. In the future, maybe for a little more interesting design, vary these grassy shapes as they take bites out of the water shape, and also in the width of the grass on the right and left sides. This would eliminate the water running down the middle of the painting. You have created a nice peaceful feeling with this painting. Keep practicing, keep painting, and enjoy the process! Nicely done. My only suggestion would be to lighten the centre background trees to ‘push’ them back a bit but otherwise it is very well executed. Congratulations. I really enjoyed the brilliance of the blues and the contrast of the dark and lighter greens of the grassy areas. I like the way you have the sun just hitting the mountain peaks and the rest of the scene is in shadows. A nice study in water and ice, a little cold for my taste. The river looks like a series of waterfalls, a little more irregularality in the river banks together with a different use of shadow and reflection might work better. The mountains are very good, you’ve caught their majesty and splendour well. I like it but maybe a little lighter blue in the sky. It is bold! I love the dark, rich colors, Lovely! “great work” is the only phrase i can think of looking at ur painting. it is very very attractive painting. all other errors may be forgiven just because it is so beautiful and attractive. i saved a picture of ur painting, hope u dont mind. 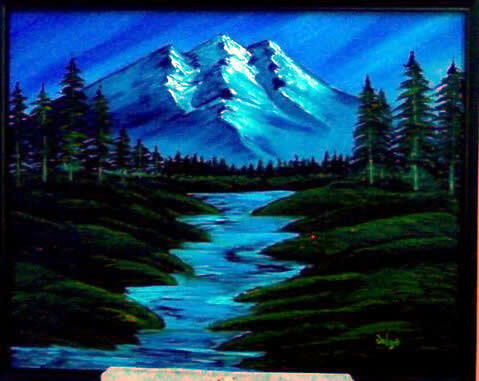 I love the colour Blue and I think it is well cellebrated in your painting with the different shades. Vibrant Colours Vidya. Even though basically it is a beautiful painting, I feel that the stream/river and the mountain appear to be competing against each other for attention. In my humble opinion, there is also lack of aeriel perspective,i.e. the foreground and the background have the same clarity and tone, which detracts from the naturalness of the beautiful scene. A very good painting…good job done vidya, i think you should take painiting seriously. Iam verymuch happy to see your Painting. It is very nice. Keep it up. It is indeed a very beautiful painting.. Wonderful colors! Keep painting and thanks for sharing.